Lou Lamoriello surprised Leafs fans on Sunday by trading for Tomas Plekanec. 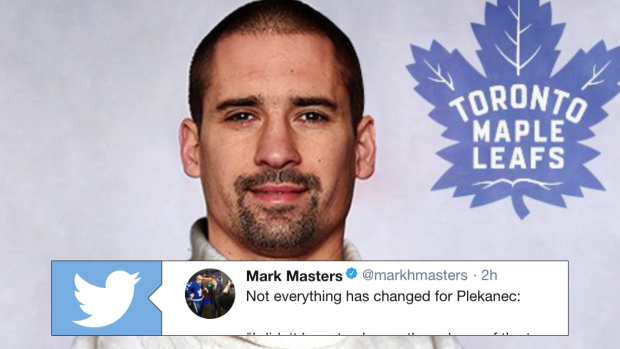 Surprisingly, the most talked about thing after the deal was made among fans was Plekanec's signature turtleneck and if he would be wearing it in Toronto. The more I think about it...Plekanec to Toronto made a lot of sense. They already had the turtler in Kadri...now they have the turtleneck too. On Monday, Plekanec met the Leafs in Tampa Bay and skated with the team for the first time in, you guessed it, his signature turtleneck. Following practice, Plekanec was asked about the turtleneck and had some fun discussing it. "I didn't have to change the colours of the turtle neck," Tomas said with a grin. "That's a good thing." The former Hab also discussed shaving to comply with the Leafs' rules. "It was different looking in the mirror this morning, but that's the way it is. Those are the rules ... right away I got messages from guys that I have played with who played under Lou & they told me right away, 'You got to shave that.'" It seems like the fans are divided on the turtleneck, but if Plekanec plays well, especially in the playoffs, we'd venture to guess that he'll start a fashion statement.